…that Connecticut resident, Augustus G. Hazard owned and operated over 100 gunpowder mills in the Hazardville section of Enfield. Born in Kingston, Rhode Island, at the turn of the 19th century, Augustus George Hazard moved at the age of six with his family to Connecticut. 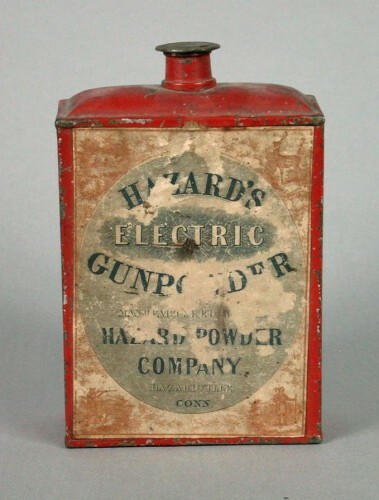 In his early 20s, Hazard established himself in New York City’s shipping and wholesale businesses and served as the general agent of the Loomis & Denslow Co., a gunpowder manufacturer. In 1837 Hazard purchased a small portion of the company, and by 1843, having bought out the Loomis brothers, Hazard and partner Allan Denslow formed a joint stock venture called the Hazard Powder Company. Hazard moved his family back to Connecticut, where they settled in Enfield, in order to better run the company. Success brought rapid growth and the enterprise soon comprised over 100 separate mills on 400 acres of land in an area known as Hazardville. During the Civil War, the company supplied 40% of all the gunpowder used by the Union army. Success, however, did not increase safety in an inherently dangerous business. Explosions were common in the mill, and in January 1913 one tremendous blast destroyed the Hazard Powder Company. The blast was so powerful that Hartford residents heard it 20 miles away.